It’s Friday!! And that means it’s almost time for sweatpants and relaxation. And I’m ready for it. You guys, this week has been so busy. Actually I feel like the past couple of weeks have been busier than normal and I’m kinda running on fumes at this point. I need a few days to rest and recharge my batteries. Hopefully that happens this weekend! Anyway, I’m coming atcha again today with another vintage find. That’s two in a row this week! This one is actually a Craigslist find and I just bought it a few days ago–it’s an antique washstand. I honestly can’t decide if I should paint it or leave it alone, so I figured I would go ahead and share it with you lovely ladies today! Isn’t she a beauty? I love the little swing door on the right side. And those casters! I did some research and I’m pretty sure this is an Eastlake washstand, which dates it back to the late 1800’s/early 1900’s. This one is very similar. I paid $100 for mine, which is significantly less than similar cabinets I’ve found online. And isn’t it crazy how it matches that mirror?! My vintage loving heart is just smitten with this little washstand. I can’t help but think about all the homes it has been in over the last 100+ years. 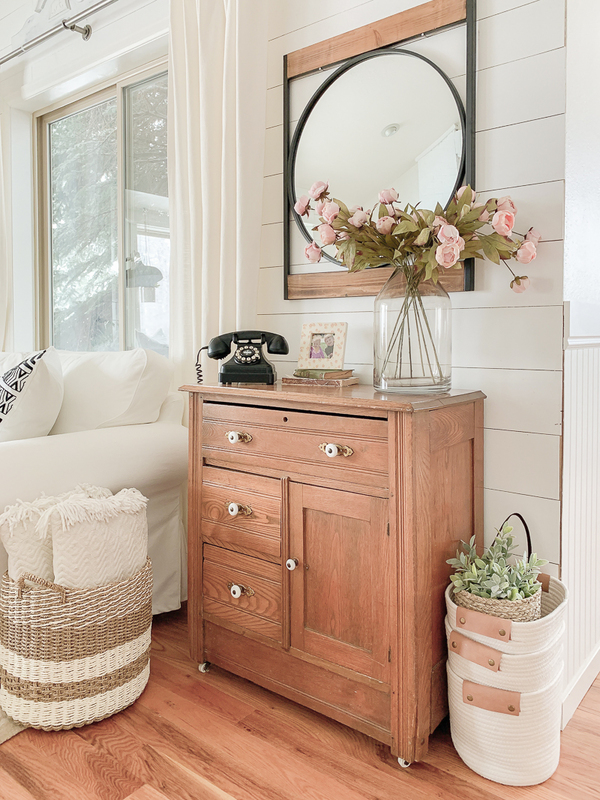 It’s such a little treasure and I love the charm it adds to this room. And side note–how pretty are those faux flowers?! They’re from Michaels. The hardware on this isn’t original, so I might check out Etsy for some antique drawer pulls. And right now I can’t decide if I want to paint it or leave it alone. What do you think?! I always hesistate to paint pieces that are THIS old, but then at the same time I also think paint can make a piece like this look even better. I’m tempted to go white, or even a fun color like a soft minty green, but I just don’t know what to do. I think I’ll let this piece sit here for a while before I decide what to do with it. I definitely don’t want to rush painting it and then regret it, so I’ll wait for a while and see how I feel. That seems like the reasonable thing to do, right?! I think so. Anyway, I hope you guys liked seeing my latest Craigslist find. Thanks so much for stoping by the blog today!! I’ll see you back here Monday–and get ready because I have exciting news coming!! I love it natural, it shows the beautiful lines of the piece and it’s so nice to see a pretty wood piece with all the white. Hi, I love it!!!! I too am buying up a storm on craigslist. I just purchased a beach house in NJ and I am finding some great finds. Some I paint some i leave alone and some I buy already painted and distressed. But in your case with the washstand, I would leave it alone. It looks amazing and it has its 100+ year distressing already done!!!! I love it. Ok Sarah ,Step away from the paint brush! This piece is in great condition ,has a lovely patina and is a perfect match with the contemporary mirror. The wood adds depth to the rest of the very light colors in the room . If the wood and finish were in bad shape I’d say paint it but this is just lovely . I have an Eastlake washstand. Mine is a little different than yours but it looks like the same wood. My hardware is original and is metal/tin with pulls. The door has a latch turning type handle. (I would send you a picture but I won’t be back home for a month.) I hope this helps you in finding “new” antique handles! I agree with the majority…don’t paint it! It’s a great find! Don’t paint it. It’s beautiful! I agree with the other comments. It looks to be in great shape and I love the color of the wood with all of the neutrals and it looks great with the mirror. Great find, Sarah! I love it! It looks perfect as it except I agree about changing out the out-of-date knobs. It matches the mirror about it perfectly! Great find! Dad’s side had a dresser exactly like this one. She used to put a porcelain potty in the side door. They had no inside plumbing and it was in case you had to use the bathroom at night. Sometimes antique pieces should be allowed to celebrate their longevity(not unlike an aging woman). It’s not necessary to spackle/paint/alter…every nick and scratch, every bit of patina tells a story of a life well-lived. Besides, it looks fabulous in your neutral home! Beautiful piece of furniture at a great price. Please do not paint it. The beauty is in the wood on this one. Beautiful find Miss Sarah! 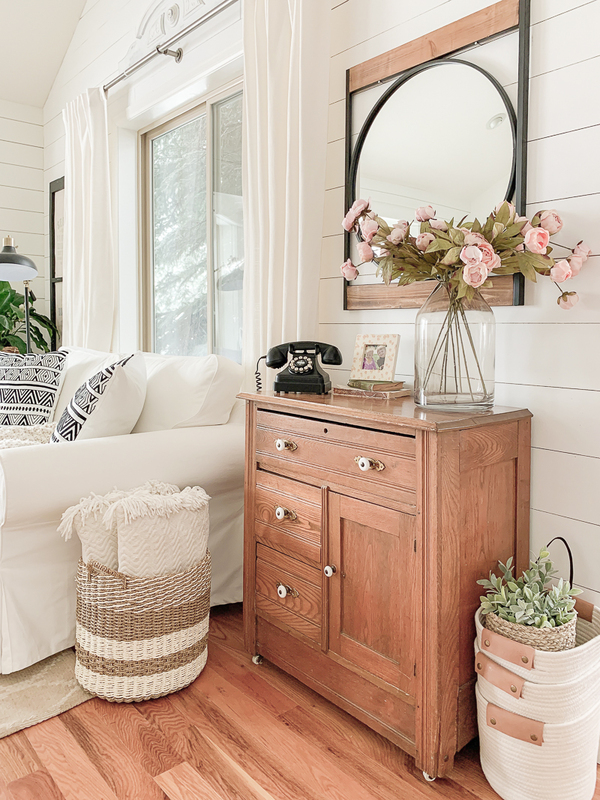 Agree – walk away from the paint brush on this one, especially because of the wood tone of the mirror – perfect styling with those Michael’s florals. I also like the hardware but if you find the perfect vintage ones, why not? Love your style! Hi Sarah! What a lovely piece and it looks great there with the mirror over it! I have to agree with the other posts, the natural finish is too pretty to paint over. And the natural patina ties in beautifully with the wood on the mirror. 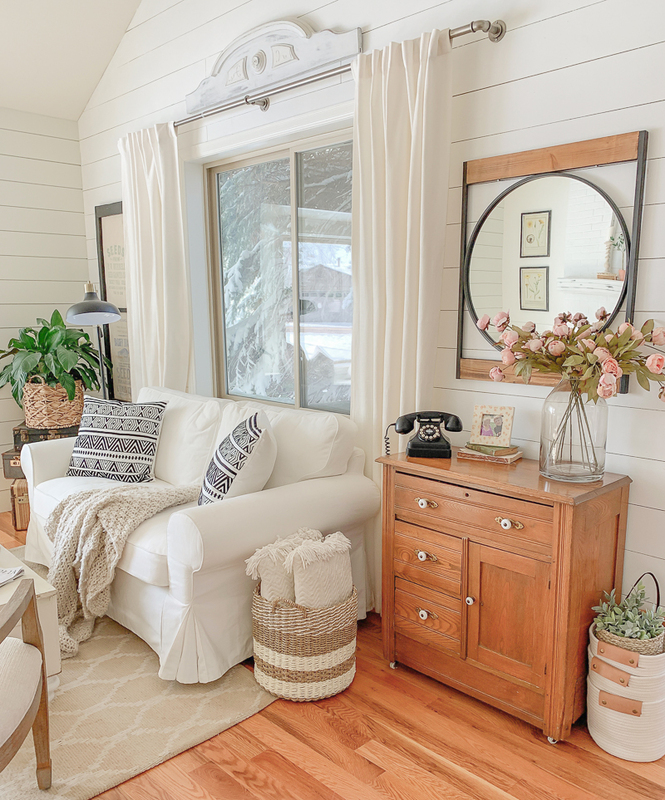 I love to see warm wood in a white painted room. Your room is so inviting and pretty! Let me the natural wood! It just fits in that area! Thank you for sharing! Great find! I wouldn’t do anything except maybe change the knobs …. it looks so good as and where it is! I say leave it, it’s gorgeous! I would not paint it!!! Its such a beautiful piece and since you have so much white in your room already II,d leave it to shine it’s own glory! 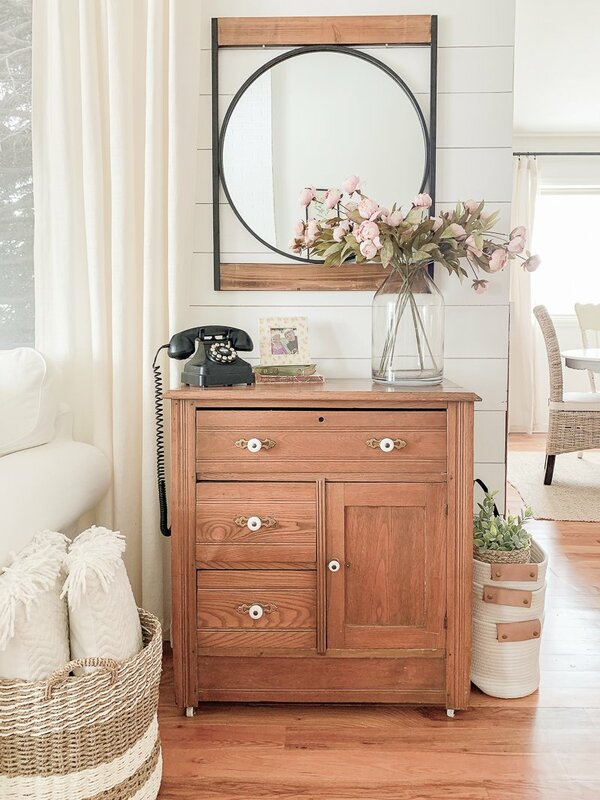 I think the wood is beautiful but I can see old glass knobs & that will freshen it up. I 💜It!! Your flowers look so real! It’s perfect! Can’t wait to see it with new hardware! That is a beautiful piece! I love me some chippy white furniture but that looks to be in really good condition, and it pulls together with your mirror! Having said all that, whatever way you go will look awesome. It looks beautiful with your mirror I say don’t paint it. Love they way it looks in your room. It adds a touch of the rustic with the colour of it. What a beautiful score on Craigslist you found! Did the mirror come with it too??? A soft minty color would be gorgeous with new pulls!! I am agreeing with the comments already posted about not painting the washstand. 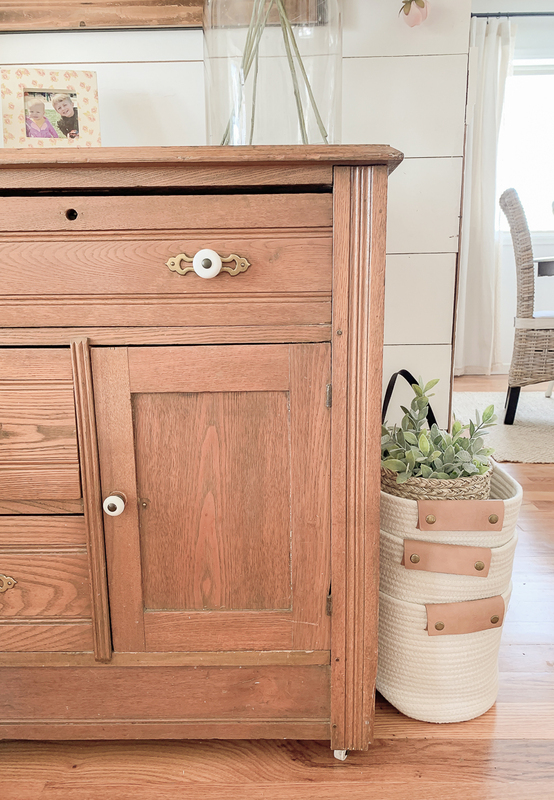 One thing not mentioned is you decrease the value of an antique piece of furniture when you cover the original finish–a point to consider in case you ever want to sell it. And, I do like the contrast of this finish with the rest of your furnishings. Always enjoy your blog. I love it the way it is! It is gorgeous!! Hi Sarah, I have been following you for awhile and love all the ideas you come up with. Love this wash stand. I think I would leave it just like it is. It really goes good with your mirror and really compliments the room. Love the flowers as well. Great find. I think it is absolutely perfect as is. It brings a lot of contrast to your white room. Don’t paint it. I’m someone who is loves chalk paint on almost everything. But on this piece the wood is so beautiful and soft looking. Please leave the wash stand as is! It’s gorgeous and matches your mirror perfectly. What a great find! Another cute find.Yay for the win! Looks perfect with the mirror. Leave it for awhile and see how you feel later! Hi Sarah: I agree with everyone else it’s a beautiful piece and I would not want to paint it. It matches the mirror so well and is a great wood piece that complements in the room so we’ll. Curious – how do you find such amazing finds on CL?? Please share some of your secrets!! Hi Sarah: I agree with everyone else it’s a beautiful piece and I would not want to paint it. It matches the mirror so well and is a great wood piece that complements the room so well. What a gorgeous piece! Please don’t paint it! It looks beautiful with your mirror! Have a restful weekend! What a wonderful find! I love the washstand and the mirror. It looks awesome where you have them. Whatever you decide to do either paint or leave it will be great I know. I paint furniture to, but I usually do on pieces that are damaged. Obviously, it’s yours so you have to do what is best, but it’s only original once! And D Lawless has great hardware! Ok – I’m going “against the grain” of what others are saying – but I beat to my own drum anyways. If I bought this piece for myself I would paint it and give it real character. Now – you are talking to someone who’s love for Oak anything has completely faded through the years. The great thing about paint is you can always strip it! I would paint it! I love white! Never gets old to me and so fresh!! I personally wouldn’t paint it since it’s so old. As Ruff Ruffman says “you can’t un-toast the toast”. (Since you have littles I assume you’re familiar with Ruff Ruffman on PBS). If it is in good shape…which it appears to be…I would leave it alone. It’s just enough contrast to compliment all the white you have going on. I agree with you…find some neat hardware….that alone will change the piece. Leave it!! It’s antique, I love painting pieces for the farmhouse feel but this one is the perfect natural color that goes perfectly! That wood looks like it’s in such good shape. I’d really think long and hard about Not painting this piece. 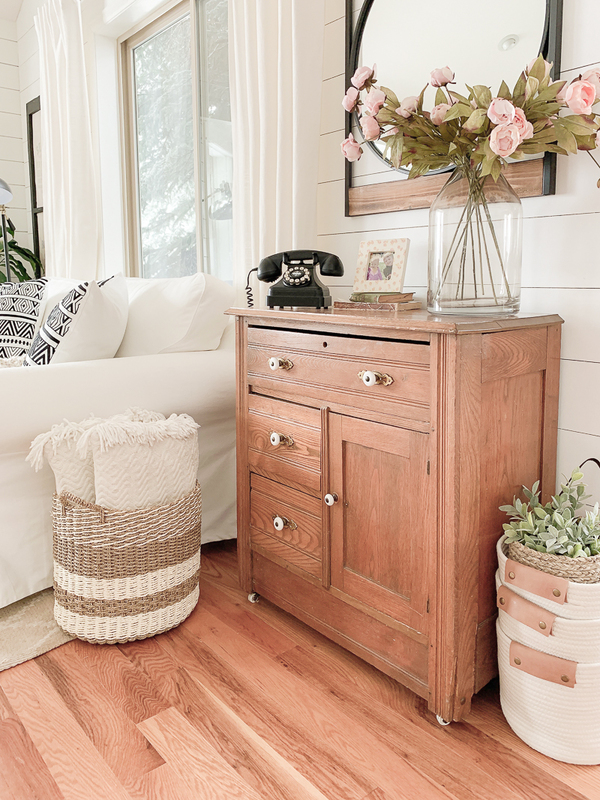 With all the white and neutral you have these beautiful wood tones add so much texture. Thats just Me! You need to do what’s good for you. I am all for painting…however, I believe I would leave this piece as is. Why cover up her history…let her tell her story just the way she is. My opinion only…she is a keeper for sure! Love it! I really like the wood finish and how it goes with your mirror. Awesome find! I am not a fan of oak, but because you have so much white I think I would let it be for awhile. I definitely would try the hemp oil on it and new knobs could be awesome! Leave washstand as is, it’s beautiful. I would replace the knobs but I would not paint it….it’s beautiful as it is! I love it! I would leave it just as it is, it’s gorgeous! I love this piece Sarah! The warm tones of the finish are exactly what this space needed, so I would definitely not paint it! I love this piece Sarah! I have a few of these saved on Facebook Marketplace! I say leave it just like it is!! It looks amazing right where it is and exactly like it is! 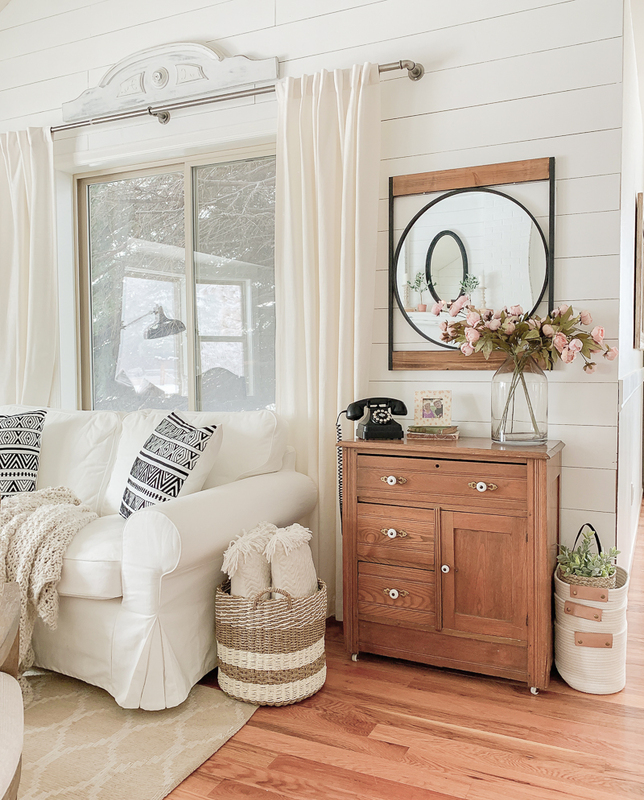 I love the contrast of the wood against the white shiplap. Woods, whites, blacks, and throw in a little green 🥰🥰🥰🥰🥰 I can’t wait to see what your exciting news is!!! That one is perfect as is. And looks perfect in your room. Here is a suggestion, if you are going to paint it maybe leave the drawer and door fronts original wood to tie in the mirror. I would leave it alone! Change the hardware but do not paint it! I would leave it the natural, it gives the room some depth. 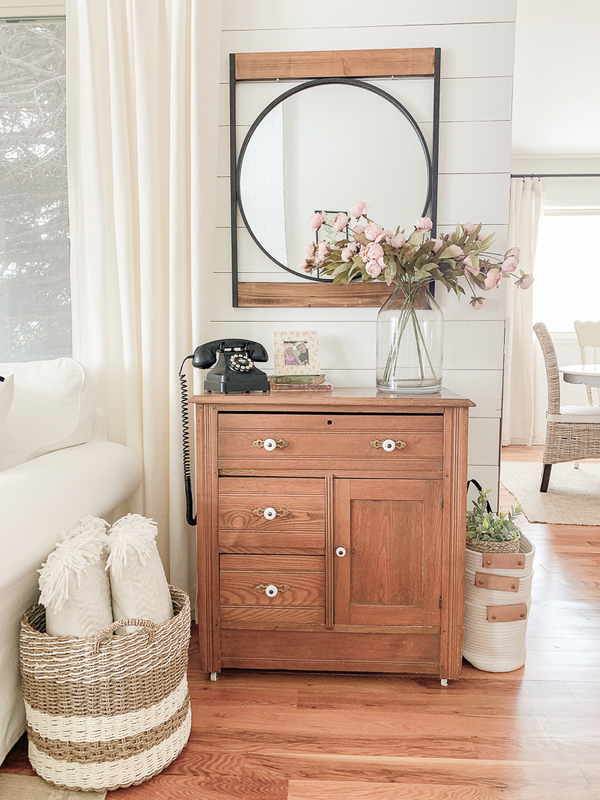 Hey Sarah, love the antique washstand, but that paired with the phone and mirror in the background really bring it home! No, don’t paint. 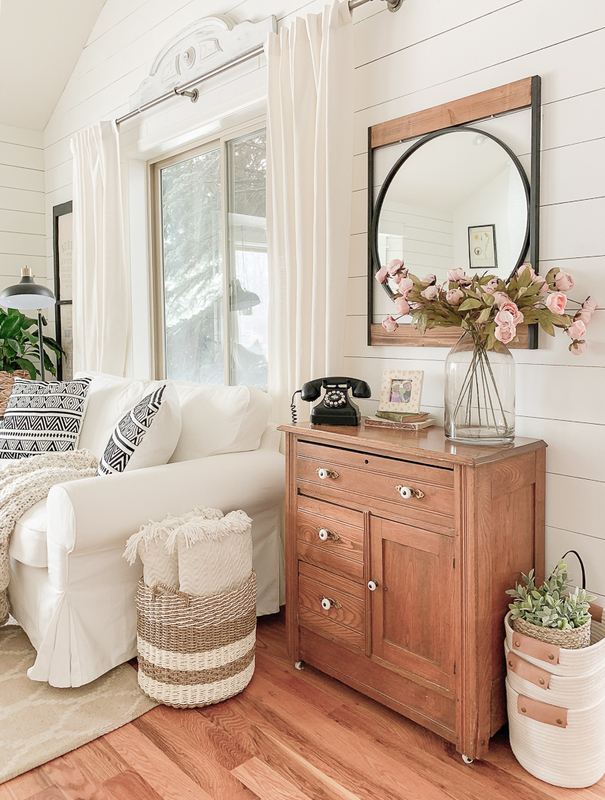 The wood tone in front of the painted shiplap is perfect!